The concept of securing ‘data-in-transit’ is a concept that will be familiar to all staff working in network security today. All secure data traveling across the ‘wire’ should be appropriately secured and this has traditionally been done based on the protocol that they are using, such as SSL/TLS for web communication or whole network encapsulation such as PPTP and IPSec. This issue with using this encryption is that they incur a considerable performance overhead when compared to the original method of transition. VMware has elected to leave the communication unencrypted and instead recommends the use of secure networks, which In the author’s opinion is so that all information is transferred in the shortest possible time, resulting in less disruption during migrations. This is another example of the balance of the confidentiality, integrity and availability triangle discussed throughout this thesis. VMware have obviously considered the option to encrypt VMotion traffic in the past, as it was an option found under the advance settings of vCenter Server Settings as can be seen in Figure 1. 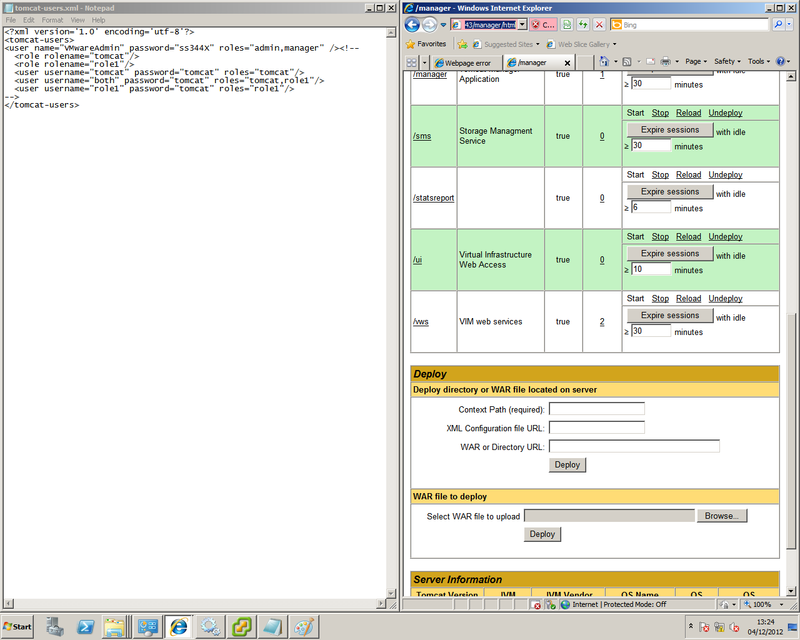 Although the setting appears to allow the requirement of all vMotion traffic, there are examples of vCenter not honouring the setting and continuing to send the information in the clear text (Van Dirmarsch, 2009). 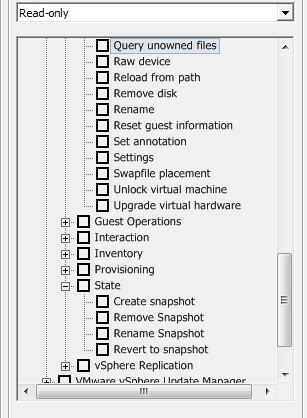 In the version 5.0 of VMware the option is no longer present, as can be seen in figure 2. VMware leave no other realistic option for securing this information other than by isolating the vMotion network, restricting access and ensuring that promiscuous mode is not enabled when communicating through a vSwitch (Wu, 2008). While this might be suitable for networks containing less sensitive data, for the author it offers no option for any defence in debt strategy, other than disabling all automated vMotion features (DRS/DMP) and disabling vMotion at the switch (VMware, 2009). Due to the risks that surround unencrypted vMotion traffic and VMware’s reluctance to offer any further protection, there are numerous best practice guides available online demonstrating the best methods to configure networks for multiple hardware scenarios. One of the more comprehensive guides is (Kelly, 2012) who demonstrates a number of examples which comply with VMware’s isolation requirements. An example of one of (Kelly, 2012) diagrams is shown in Figure 3 and shows the best practice vSwitch configuration for a six NIC host with isolated iSCSI storage requirements. The example given by (Kelly, 2012) does provide the isolation that is suggested by VMware. However as is seen in Figure 3 the Management network and the vMotion network are on separate logical networks, separated only by a VLAN ID. 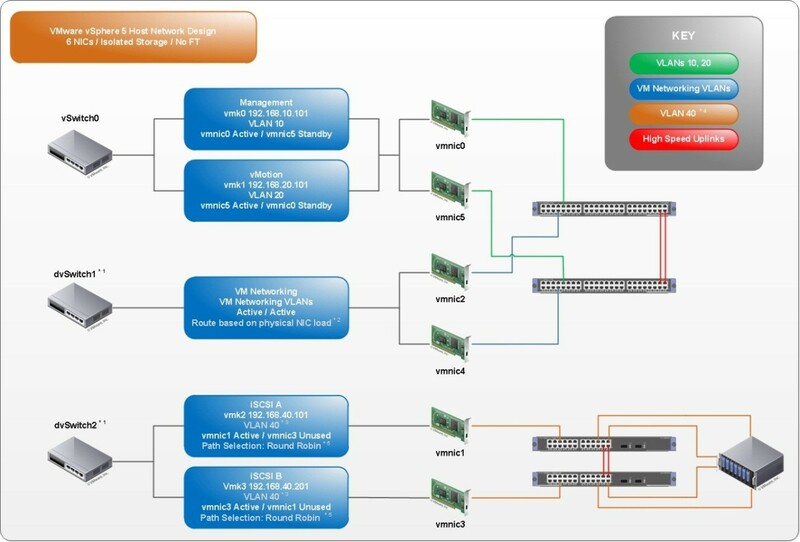 This is not uncommon for VLAN’s to be used in virtual environments as using multiple physical networks to isolate these services would become both increasingly hard to manage and impractical. It is also impractical to map physical connections in and out of blade environments, without dramatically affecting the redundancy of the chassis, due to slot limitation. VLAN’s, while commonly used by numerous organisations to segment traffic, still carry the information over the same physical ‘cable’ and do not offer the same level of security as physically separated connections. There are tools available that exploit flaws in implementations of VLAN’ing and that allow VLAN ‘hopping’ through frame tagging attacks (Compton, 2012). Although these nested attacks may seem unlikely, they are still a valid threat that should be at least considered. However, this does not diminish the argument that this information is still being moved inside the environment and should these guidelines be overlooked or the networks breached, the consequences of what can be achieved can be unintelligible to staff only familiar with traditional methods. Live migration can be used to move machines between hosts that are located in the same blade chassis, across campuses and even over different continents, with minimal downtime (Travostino, et al., 2006). The action of preforming a live migration from one host to another is a common feature found in many of the larger VMMM such as XEN and VMware. The act of moving a machine across hosts in the VMware environment can be a manual or automated process when combined with other features such as DRS and DPM (Distributed Power Management). While explanations of the DRS feature is discussed in numerous earlier posts, DPM enables vCenter to automate the movement of machines off hosts during quiet periods of usage, allowing them to be powered down thus improving power consumption. It is my personal option that live migration is one of the more intriguing introductions of virtualisation, as the information that is located in RAM contains such important information. The request is made specifying the VM and which host it will be moved to. All of the RAM of VM1 is copied over the vMotion network to ESX2, any active changes happening during this time on ESX1 are written to a memory bitmap on ESX1. VM1 is quiesced on ESX1 and the memory contained in the bitmap is copied over the vMotion network to ESX2. 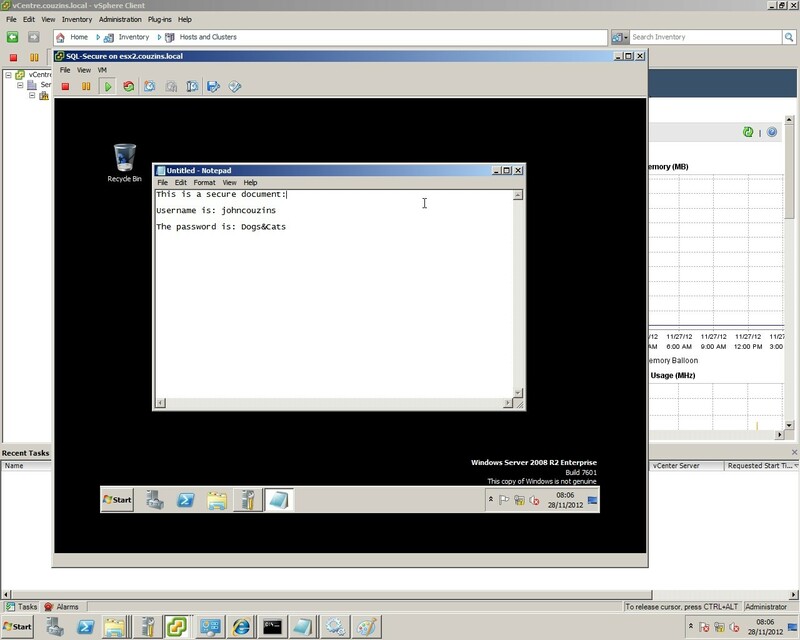 VM1 is started on ESX2 and access to the VM are sent to the instance on ESX2. Remaining memory from VM1 is copied from ESX1, while memory is being read and written from VM1 on ESX1. Once successful, VM1 is unregistered on ESX1 and the task is complete. In figure 1 we see a basic visual representation of the process in the test environment. For demonstration purposes and ease of result display, I have a separate vMotion network that uses a hub to connect the two machines. This will allow me to sniff traffic without having to perform an additional attack such as MiTM or configure port mirroring, port spanning, SPAN, RSPAN etc. In the virtual machine that will be moved, I have written information into a text file but not saved it to disk, so that we can be sure it will be located in the machines memory. This information in the example is a representation of a secure document containing a username and password. This text file and content are shown in Figure 2. Although this example used a notepad document to demonstrate the ability to sniff data, there are much greater risks to consider when addressing passive snooping attack on migration traffic. Microsoft stores LM authentication hashes for active sessions in memory (Pilkington, 2012) in all current versions of Windows. As a result, should a passive snooping attack take place while a machine is locked or logged on, the LM hash will also be viewable in the capture. Windows LM hashes are also reversible back into the user’s original password using online services such as (OS – Objectif Securite, 2012) and other hash cracking tools. Finally, and possibly of most concern, is the accessibility of encryption keys. Even when full disk encryption is used to secure data, the keys (after initial user input) are cached in memory by the operating system. On traditional hardware this is considered the safest place, as volatile memory is erased quickly once the power is taken away. This is something that usually requires physical access to the machine to exploit, unless the machine is already infected. It is now possible to sniff the encryption key during a live migration to obtain the encryption hash. The migration of machines onto illegitimate hosts that are owned by the attacker. Mass migration of a large number of machines, thus overloading the network and causing disruption to service. Manipulating the resources management for hosts in a DRS style environment, so that hosts are not evenly distributed and overwhelm single resources. Data plane attacks are threats that take place on the networks on which the migrations are situated. The passive snooping attack that was demonstrated previously is one of the attacks that are briefly mentioned in the paper. The second attack on the data plane class is described as ‘active manipulation”. As the name suggests, active manipulation is when data is changed during the migration of the machine. Although in the paper (Oberheide, et al., 2007) introduce their custom tool Xensploit for preforming this attack, it is merely the collection of existing attacks collated into one tool for ease of use. The attack works by using MiTM characteristics to intercept traffic between the two hosts and manipulating sections of the traffic (RAM) during transit. In the example of the Xensploit software in the paper (Oberheide, et al., 2007, p. 4) showed how the attack could be used to establish an SSH (Secure Shell) session to a machine configured to only allow connections from authorized sources. Using Xensploit they were able to manipulate within the object code of the SSHD process to add their key as an authorised source, thus allowing them to SSH once the new instance had completed its migration. Lastly, although these attacks are included in the paper, I feels that this section falls under one of my other previous topics of the hypervisor rather than on live migration. The paper briefly covers attacks that exploit vulnerabilities in the migration models – that are part of the VMM (virtual machine monitor). Gaining access to any of these attack classes should be considered a high risk to security staff, although with access to just one of the vectors, it may still not be possible for an attacker to target a specific machine depending on its physical location. If a combination of the attacks were available, the attacker would be able to leverage them to better achieve control of the environment. An example of this is in the case of data plane class attacks. These attacks are only useful if the target machine is being migrated during the period of capture. In environments where features such as DRS and DPM are not in use, it is possible for machines to stay fixed to a host for a considerable period of time. If the attacker was able to utilize an attack at the control plane they would be able to trigger the migration of the necessary machines for the attack to then take place at the data plane. While I can appreciate what (Wu, 2008) is saying, I must disagree that these types of attacks are comparable to physical environments. Data-In-Transit on physical systems do not tend to include such sensitive information. It is also better understood in traditional systems that unsafe protocols such as email and ftp should not be used to transfer confidential information. While the previous example required physical access to the vMotion network, it is also possible to access this data remotely through misconfiguration, access to the management interface or manipulation of virtual infrastructure. Travostino, F., Daspit, P. & Gommans, L., 2006. Seamless live migration of virtual machines over the MAN/WAN. Future Generation Computer Systems – IGrid 2005: The global lambda integrated facility, 22(8), pp. 901-907. Virtual environments introduce a host of new features that are designed to increase the availability and manageability of computer systems. These features include the ability to move live virtual machines across physical hosts with little to no disruption to service and even automatically shift entire workloads and power off unnecessary physical hosts, to better utilise power consumption. These features rely heavily on networks to transmit information between physical hosts. An example of one feature that is dependent on one of these new networks is VMware’s vMotion. VMotion allows virtual machines to be moved across hosts in an infrastructure, allowing hosts to be taken down for maintenance or patching. This is done by transmitting a snapshot of the VM’s RAM across a network to the receiving host. Features like vMotion mean that systems benefit from extremely high uptime, with relatively low cost implications, in comparison to their traditional counterparts. Although vMotion is a VMware product, the concept of live migration is the same concept across numerous implementations, including Xen’s implementation named ‘XenMotion’. The information that is now transmitted over these networks as a result of these features can pose serious security considerations that are not comparable in traditional systems. The movement of RAM from outside the chassis of a server tower is something that has not been an issue prior to these features. Now is it possible (in poorly designed implementation) for entire portions of RAM to be sent unencrypted over user-accessible networks. The Storage area network is an element of the virtual infrastructure that is often left unsecured as it is not uncommonly configured by separate groups of specialists who are not as security conscious as the networking teams (Lewis, 2002). While SAN security is a very pertinent threat when discussing virtual environments, I will not be detailing how attacks and mitigation techniques can be achieved in this blog because of the level of familiarity that is required and the difference in technologies when compared to regular networking. There are however numerous pre-existing guides to SAN security that should be consulted before introducing the technology into any environment (BROCADE, 2007), (Haron, 2002), (Majstor, 2004). I know that this a deviation from my series on virtualisation security, however I feel it’s worth it. I think that the latest new about WhatsApp/Facebook deciding to implement Moxie Marlinspike’s TextSecure by default, is a very big step for the future of secure communication. Instant messaging is sometimes snubbed among enterprises as a technology that is more designed for social interactions and teenagers, however IM is now doing what email has failed to do transparently for years. Sending anything securely over email in 2014 is still an additional process is not part of the protocol. I am not naive enough to discount that multi-client communication might change IM’s ‘transparentness’, but it’s still a positive step. I think that this will really see an increase in the use of these technologies, with hopefully others following suite. There is also the idea that once public key cryptography is more widely adopted among end users, it would not be out of the question to see users public keys stored in address books alongside addresses and birthdays. Maybe the future isn’t going to be as dark as we thought. In VMware’s hardening guide, they offer a number of mitigation techniques that can be used to further secure vCenter from exploitation. The majority of the recommended measures around securing vCenter are of an operational nature rather than reconfiguring settings within VMware. A total of six of the options concerning vCenter alone in the documentation include measures that should be taken in the network to avoid the likelihood of MiTM attacks. Much the same as in my earlier post on hypervisors and throughout my blog, isolating these networks from any user reachable subnet is an advised approach for all management interfaces. If an attacker is unable to directly query the target, they are not able to directly exploit it without exploiting another system or finding a flaw in the software controlling the ACL’s. Although the segmentation approach will thwart the majority of conventional attacks, it is the authors opinion that securing such high target interfaces with usernames and passwords is inadequate and that further authentication processes are necessary. While not native to the vSphere product, it is possible to use third party solutions, such as HyTrust (HyTrust, 2012) to require ‘two factor authentication’ for access to the interface. It is also possible to enable two-factor authentication on other admin interfaces such as HP’s iLO. This adopts the defence-in-depth model that is used to ensure that the integrity of a system is not dependent on only one element. When two-factor authentication is not available, standard network protection measures should be followed that are intransigent with traditional aspects of network security, such as strong passwords and account lockout policies. It is also advisable to use the method of least privilege when creating the accounts that will have access to the management interfaces, to reduce the result of an attack. All management interfaces have differing levels of customization from the lesser granular options of the Cisco UCS to the highly configurable VMware vCenter. When configuring a user account in VMware’s vCenter, an administrator has the ability to granularly allow/deny individual actions on individual machines that are managed in that environment. An example of the granularity of vCenter’s permissions can be seen in Figure 1. Restricting user’s access to only allow access to the areas of the interface that are needed will reduce the total impact to the environment should a compromise of that account occur. Once an attacker successfully gains admin access to a particular element of the management infrastructure, what is possible? In traditional networks, the compromise of an ‘Enterprise admin’ or ‘root’ would be a worst case scenario. Using this account, an attacker could logon to servers, delete accounts and data/policies and affect services running on those servers. Although without pre-defined scripting, all the actions would need to be done manually on each server, which of course would have time implications. The attack would be effective, but once identified, action could be taken on uncompromised servers and machines not connected on the network by a domain trust would remain unaffected. Now consider a fully virtualised environment that is fully managed by a single management interface (which, from the author’s experience, is not uncommon). Should an attacker obtain admin access to a management interface, then the implications are much greater. If an attacker was to gain admin access to the management software that controls the environment, the implications from a defensive point are devastating. From inside the console they would be able to delete configurations, virtual switches and even full machines from both a management and disk perspective. What is often done in large environments is to create a disaster recovery environment in another location of the campus/business, so in the event of a loss of service in one location, the mirror environment could be used. It is not uncommon for both locations to be managed by the same management software as it allows increased replication and failover. While this may increase availability and functionality, it also means that gaining access to the one system could potentially allow an attacker to erase an entire site including any recovery environment. While it may not have the same initial impact, there are also a number of other actions that could be completed by the attacker once access to a management interface is gained. Misconfigurations in the way the hardware performs could go unnoticed for a long period of time, but still cause huge disruption to services that may be harder and more time consuming to identify. There are also persistent attacks that could be configured for snooping, such as placing switches into promiscuous mode in order to preform undetected information gathering. It is also possible from the interface to copy full machines offline and boot them up using consumer tools such as VMware Player (VMware, 2012) for analysis and offline attacks (Siebert, 2011). With access to the hardware management interface an attacker would be able to perform physical actions on the infrastructure remotely. These control the hardware that manages the hardware of the hypervisors, the interface fabric, power and cooling on blade systems. Although most of the actions from here are reversible, they still present a single targetable area that has the potential to severely affect service for a considerable period of time. The management interfaces and everything that is incorporated into that software is, in the author’s opinion the most problematic area in virtualisation security today. There have been numerous attempts over the last few years to demonstrate how management interfaces can be breeched. The majority of these attacks are general attacks that use pre-existing attack methods such as brute forcing, MiTM (man-in-the-middle) and the numerous flaws with the PKI infrastructure. There are multiple proven attack methods available for exploiting management interfaces and below are descriptions of some of these attacks that have been discovered by researchers. In an online blog (Mluft, 2011) talks about how a brute force attack is achievable on the Amazon Web Services (AWS) portal by leveraging existing hacking software tools. In the attack (Mluft, 2011) demonstrated how it is possible to determine a successful logon using the exemplary payloads in the Burp Suite (Burp Suite, 2012). The use of the burp suite in this example is to simply automate the process of attempting logins to the interface. The payload in the software is also able to identify failed login attempts to the portal by returning a HTTP status code of 200 (Network Working Group , 1999). A correct password attempt is identified by a returned HTTP status code of 302. Using the documentation provided by Amazons services in relation to password policies (Mluft, 2011) created an appropriate wordlist and used the burp suite to attempt all the possible permutations. After 400,000 attempts the attack was paused and the results purged for the 302 status code. The code was found and also shown alongside was the value and the password attempted. This gave the attacker the username and password for the administration of all servers managed by that account. It should be noted that all of these attempts were originated from one IP address without the account being locked-out or subject to any account throttling. As discussed earlier my earlier blog artical regarding the hypervisor, the Virtualization Assessment Toolkit (VASTO) has been developed to exploit multiple weaknesses, predominantly in the VMware family. As well as the identification module that returns the exact version of the server, it includes numerous attacks on virtual systems including a specific VMware brute forcing module, which mimics the attack on the AWS portal by (Mluft, 2011). One of the main contributors to the VASTO project (Criscione, 2010) demonstrated a number of the different functions found in VASTO at Blackhat USA 2010. Although (Criscione, 2010) demonstrated how VASTO can be used at multiple layers of the virtual stack (Client, Hypervisor, Support, Management and internal), the majority concentrated on the management portion. (Criscione, 2010) confirms that although the (VMware, 2012) hardening guide recommends segmentation of management networks, these recommendations are often ignored and left situated on the same networks as traditional servers. These servers that manage the entire fabric of the infrastructure have multiple attack vectors – from the operating systems they are installed on to the web services running the interfaces. Vulnerabilities in any one of these platforms can potentially jeopardise the security of an entire environment and should be taken very seriously. The other element used in the VASTO modules which can target the management portion of the virtual infrastructure uses target flaws in the VMware components and implementation to expose threats in the infrastructure. One of the exploits that is included in the VASTO suite that best demonstrates how multiple components in these systems can be used for exploitation, originates via a flaw in the Jetty (Eclipse, 2012) web server that is used by vCenter Update manager. In the author’s opinion, this attack signifies how the complexity and code overhead that these management servers introduce, make securing virtual environments in an efficient manner, one that needs to be understood and prioritised. I will briefly give a breakdown of this attack to highlight the multiple elements that were used to complete the attack. The Update Manager component of the vSphere suite is designed to secure the environment by automating the patching and updating process of hosts that fall under its management scope. However, (Criscione, 2010) recognised that the update manager requires a version of Jetty web server to operate. This is an additional component that is added to the total footprint of the management server. The version of Jetty installed prior to version 4.1 u1 (update 1) of the update manager was a version vulnerable to a directory traversal attack (Wilkins, 2009), which allowed attackers to view any files on a server that the Windows SYSTEM user has privileges. Consequentially vCenter stored a file on the server called “vpxd-profiler-*” which is a file used by administrators for debugging purposes. In this extensive file the, SOAP Session ID’s of all the users that have connected to that server are contained. With this ID the vmware_session_rider module, found in the VASTO toolkit, acts as a proxy server to allow the attacker to then connect through it into the vCenter server using the selected administrator SOAP ID. 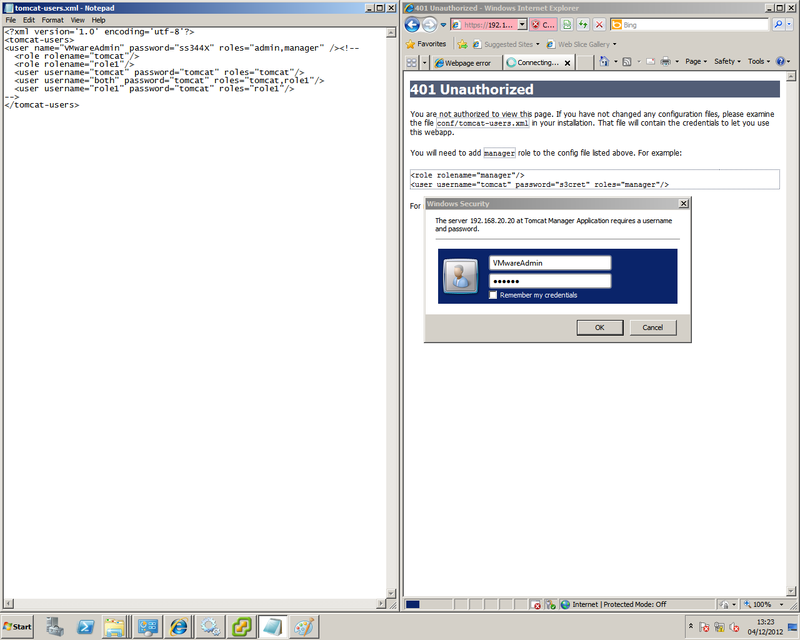 Once this is completed, the attacker is able to create a new admin credential within vCenter to ensure future access. In VMware version 4.1 there is a user named “VMwareAdmin” that is automatically added to the Tomcat server, which has full admin rights to the Tomcat service. In the earlier versions of VMware, the password for this admin account was 5 characters long starting with 3 uppercase, 1 number and one lowercase. This leaves an attacker with a number of options for an attacking perspective. The most obvious is to brute force the credentials with a compatible tools or script such as the Apache tomcat brute force tool (Snipt, 2011). A second (and more sophisticated attack) would be to use the folder traversal vulnerability introduced by the Jetty service to gain read access to the server. From here the attacker could navigate to the “tomcat-users.xml” file (C:\Program Files\VMware\Infrastructure\tomcat\conf) as shown in Figure 3, which is an XML file found in VMware 4.1 and which shows the clear text credentials of the account. Using this access, an attacker is able to control elements of the web service with admin rights. As shown in Figure 4, one is able to change a number of settings through the tomcat interface, including the ability to upload custom WAR files, which can be created using Metaspolit to upload meterpreter payloads to the server. Although some of the attacks using the VASTO toolkit are specific and use vulnerabilities that have almost all been patched by VMware (at the time of writing), the management interfaces are still vulnerable to more general network attacks that are not as fundamental to secure as simply applying a patch or updating to the newest version. As is explained briefly in by post on hypervisors, access to these interfaces are vulnerable to MiTM attacks and the implementations dependence on a highly insecure certificate/PKI model. These vulnerabilities are not directly the responsibility of the vendors, but certainly nothing has been done by them to address this issue. I will not be explaining the process of how MiTM attacks and flaws in the certificate infrastructure can be used to capture login credentials, as this a fundamental part of security and has been covered on numerous occasions by multiple sources (Irongeek, 2012) (Schneier, 2011). I have also written about the overarching problems with the certificate model and how it can be bypassed by in a blog post from 2011. Criscione, C., 2010. Blackhat 2010 – Virtually Pwned. USA: Youtube.